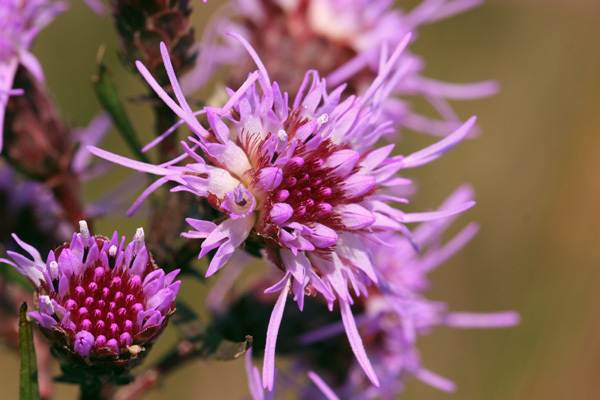 Native to the northeastern United States, New England blazing star is a showy wildflower with star-like clusters of brilliant purple florets arranged on an upright stalk. Found only in Massachusetts, Connecticut, Maine, New Hampshire, New York, Pennsylvania and Rhode Island this globally rare plant is protected under the Massachusetts Endangered Species Act. You may have seen a similar plant in gardens which is the widely cultivated garden blazing star, Liatris spicata, which is native to eastern North America, but not found naturally on Nantucket Island. Unlike its cultivated relative, the rare New England blazing star thrives in disturbed sites with sandy acidic soil, a habitat limited to coastal areas in the heavily forested Northeast. Land managers use techniques such as prescribed fire, mowing and brush cutting to maintain the open habitat this plant prefers. In addition to land management, Nantucket’s wind and salt spray help to keep woody vegetation from crowding out these plants, which require ample sunlight and bare soil for germination. Fire also stimulates flowering and seed production, creating bright splashes of purple in recently burned areas. Alongside goldenrods and asters, these late season blooms attract monarch butterflies and other insects. Look for this plant along road edges in the Middle Moors and in our sandplain grasslands at the Head of the Plains and Ram Pasture. The Nantucket Conservation Foundation is a private, non-profit land trust that depends on contributions from our members to support our science projects, conservation property acquisitions, and land management efforts. If you are not already a member, please join us! 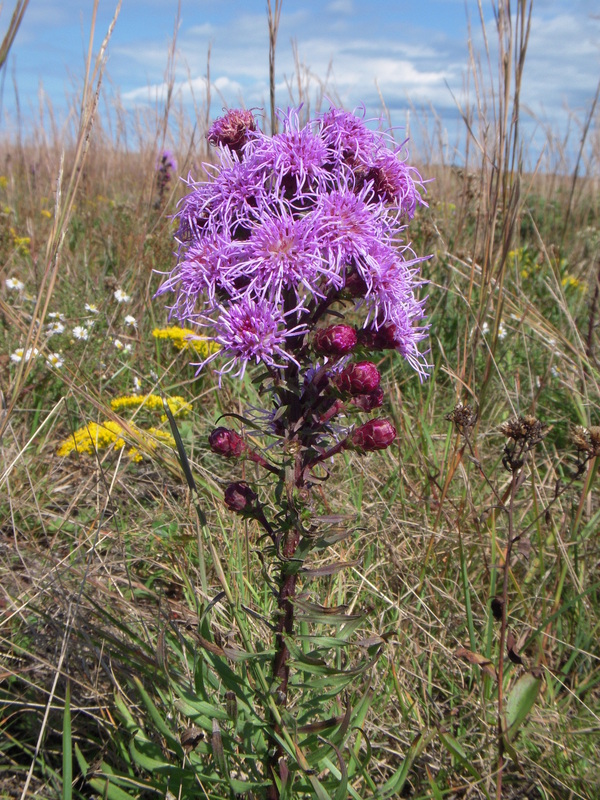 This entry was posted in What's New In Nature and tagged Liatris, Nantucket, Nantucket Conservation Foundation, New England Blazing Star, sandplain grassland, what's new in nature. Bookmark the permalink.